Horseweed (Conyza canadensis L.), also known as marestail, is a broadleaf weed species native to North America. Increased adoption of no-till cropping systems in past decades has allowed horseweed to become a major weed problem in agricultural fields. Horseweed typically follows a winter annual life cycle, but it also has the ability to germinate and emerge in the spring competing with crops just like other summer annual weeds. The seed of horseweed is very small with a pappus which creates the ability for seed to move long distances by wind and infest new locations. Therefore, the threat of this weed spreading herbicide-resistant biotypes to new locations through naturally occurring seed movement is high. In 2000, a biotype of horseweed in the state of Delaware became the first confirmed glyphosate-resistant broadleaf weed in the United States. Since then, glyphosate-resistant horseweed has been confirmed in 21 other states including the nearby states of Illinois, Indiana, Iowa, and Michigan. There are currently 24 different glyphosate-resistant weed species worldwide, 14 of which are in the United States. In 2012, a population of giant ragweed (Ambrosia trifida L.), collected from Rock county in 2010, was the first confirmed case of glyphosate resistance documented in Wisconsin. 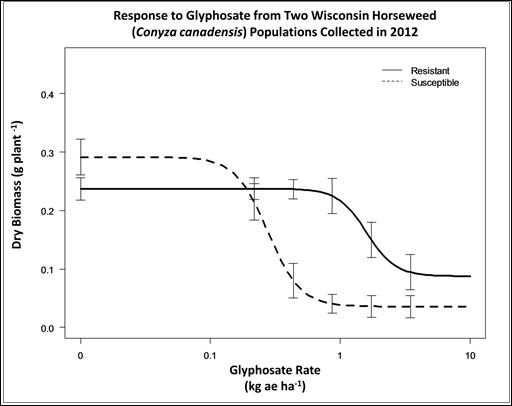 Our research has now confirmed that a horseweed population collected in Jefferson County, Wisconsin in the fall of 2012 is resistant to glyphosate. 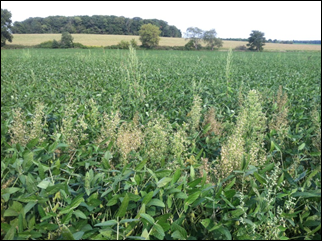 This horseweed population was identified through the Late-Season Weed Escape Survey in Wisconsin Corn and Soybean Fields, which is primarily funded by the Wisconsin Corn Promotion Board. In this particular no-till soybean field where the population was found, two small patches of horseweed plants showed common phenotypic response symptoms often noticeable on glyphosate-resistant horseweed plants following exposure to glyphosate. That typical symptomology was a stacking of leaf nodes and a proliferation of branching from main stem axillary buds. Field records, as well as communication with the grower indicated these plants likely survived a postemergence application of glyphosate. To further confirm resistance, however, seeds from 35 mature plants were collected in late-August the progeny plants were subjected to further greenhouse confirmation experiments (Figure 1). Figure 1. Horseweed plants late in the 2012 growing season that were not controlled with a previous postemergence glyphosate application in a no-till soybean field in Jefferson County, Wisconsin. An initial glyphosate screening experiment and two glyphosate dose response experiments were conducted in the greenhouse at UW-Madison to compare the effective dose needed to reduce plant shoot biomass by 50% (ED50)between the collected Jefferson County population and a suspected susceptible population (Figure 2). The ED50 of glyphosate was estimated to be 1.59 kg ae ha-1 (40 fl oz ac-1) and 0.28 kg ae ha-1 (7 fl oz ac-1) for the Jefferson County and susceptible population, respectively (Figure 3). Therefore, the glyphosate-resistant plants from Jefferson County were nearly six-fold resistant compared to susceptible plants. Figure 2. 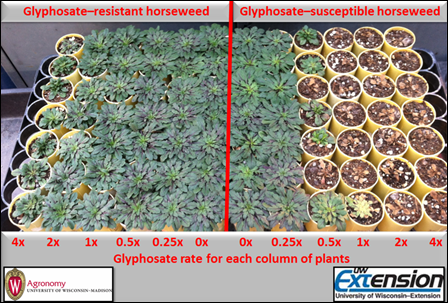 Horseweed plants (glyphosate-resistant) grown from the seed collected in Jefferson County, Wisconsin compared to a glyphosate-susceptible population and their response to postemergence at glyphosate in the greenhouse at rates ranging from 0x to 4x with 1x being 0.87 kg ae ha-1 (22 fl oz product ac-1). Plants were sprayed when horseweed rosettes measured 2.5 to 5 cm (1 to 2 inches) in diameter. Figure 3. Shoot dry biomass of Jefferson County horseweed and susceptible horseweed following treatment with glyphosate at doses up to 3.48 kg ae ha-1 as estimated by a four-parameter log-logistic regression function. The mechanism of glyphosate resistance demonstrated by previously discovered glyphosate-resistant horseweed has been attributed to rapid accumulation of glyphosate in the cell vacuole. Future research will be conducted to determine if this horseweed population from Jefferson County displays multiple herbicide resistances to both EPSPS (glyphosate) and ALS site-of-action herbicides. 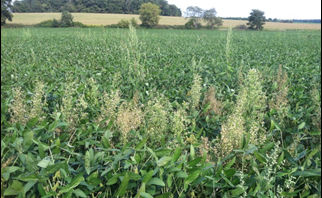 The survey which identified this glyphosate-resistant horseweed population will be conducted again in 2013. If you are interested in participating in this survey, please see the survey announcement here: https://ipcm.wisc.edu/blog/2013/06/corn-and-soybean-herbicide-use-survey-participation/. Moreover, if you have horseweed, or other weeds that survive postemergence applications and you have concern about glyphosate resistance, contact your local county Ag Extension Agent which can help you further evaluate the situation.